The Carpenters may not have been the most trendy of bands back in the 1970s, but they were certainly one of the most talented. To this day, their songs remain among the finest in pop history. Here is all the big info you should know about the famous duo. 1. Carpenters - how did they get discovered? In 1963, the Carpenter family moved to the Los Angeles suburb of Downey, hoping it may provide better musical opportunities for talented Richard. He and younger sister Karen formed The Richard Carpenter Trio with Wes Jacobs, and later performed as a duo. They appeared on the TV show 'Your All American College Show', playing a cover of 'Dancing in the Street'. 2. Carpenters - how did they pick their name? The duo had decided to sign to A&M Records as simply 'Carpenters', without a 'the', which was influenced by bands such as Buffalo Springfield or Jefferson Airplane, which they considered "hip". 3. Carpenters - what were their biggest hits? Carpenters had many hits during the 1970s, including 'Close To You', 'We've Only Just Begun', 'For All We Know', 'Rainy Days and Mondays', 'Superstar', 'Goodbye To Love' and 'Yesterday Once More'. 5. Karen Carpenter - what instruments did she play? Not only was Karen Carpenter known to have one of the most distinctive pop voices of all time, but she also played the drums for the band. She also played electric bass on a number of songs. 6. Karen Carpenter voice - what range could she sing? The lowest note Karen would sing was a D, below middle C, on the song 'A Song For You'. In 'Only Yesterday', Karen starts on a low E flat, below middle C.
8. Karen Carpenter - did she release any solo albums? In 1979, Karen recorded an album with producer Phil Ramone. It was met with a tepid response from Richard and A&M executives, and was shelved by A&M Records co-owner Herb Alpert, despite attempts by producer Quincy Jones to convince him to release it after a remix. 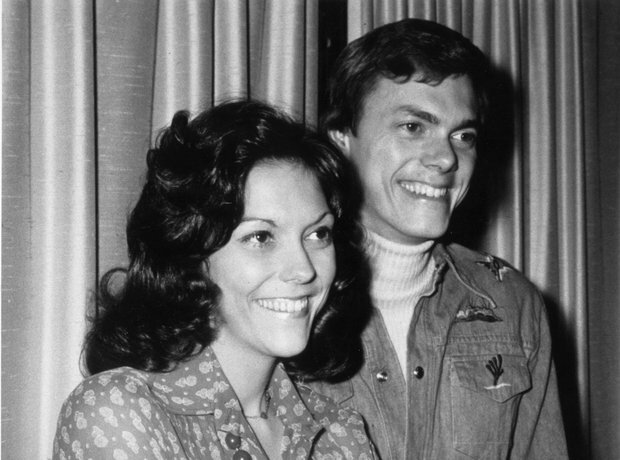 A&M charged the Carpenters $400,000 to cover the cost of the album, to be paid out of the duo's future royalties. It was finally released as 'Karen Carpenter' in 1996. 9. How did Karen Carpenter die? Karen suffered from the eating disorder anorexia nervosa for years, which was little known at the time. She died at age 32 in 1983 from heart failure, caused by complications related to her illness. Her death led to increased awareness of eating disorders. 10. Richard Carpenter today - what has he been up to since? After Karen's death, Richard has produced a number of Carpenters compilations, and released his first solo album 'Time' in 1987, sharing vocals between himself, Dionne Warwick and Dusty Springfield. He married his (adopted) first cousin Mary Rudolph in 1984, and they have four daughters and a son.